My morning routine when in a city is to get up and stop at McDonalds for an unsweetened iced tea and download podcasts. This morning is my first visit to the McDonalds that I had been to the last two years. 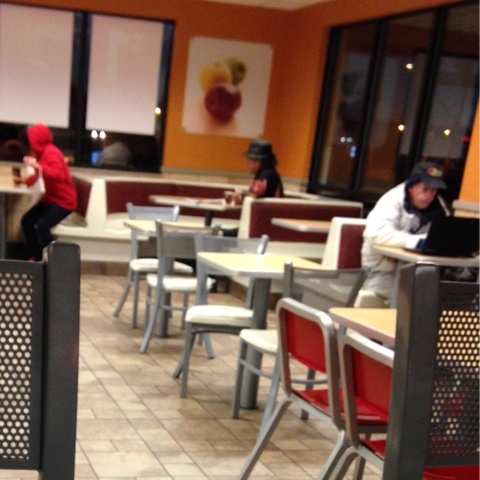 There are two men in the pucture who are regulars and I've seen over my last two years. The man in the right rides a bicycle and stops in before heading off to work and works on his laptop. The man in the corner I call the mayor of the McDonalds as he seems to know most of the people that come in and gets a handshake from most regulars. It rained overnight and the Prius was frozen with the water remaining from the rain. 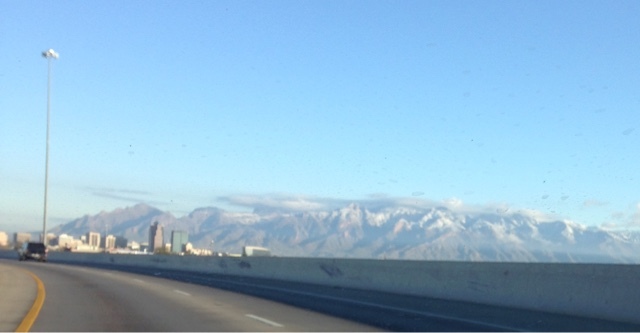 This is the first time in my travels that the Mountsins in Tucson were covered with snow. 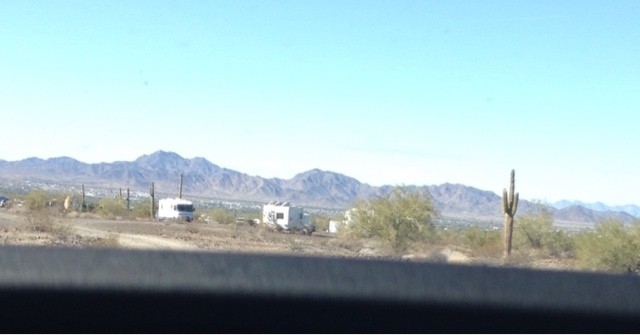 I made it to Quartzsite, AZ just afternoon and as I'm driving through the BLM land to meet up at the RTR (Rubber Tramp Rondevious) I can see the other campers along the way disbursed in the desert. 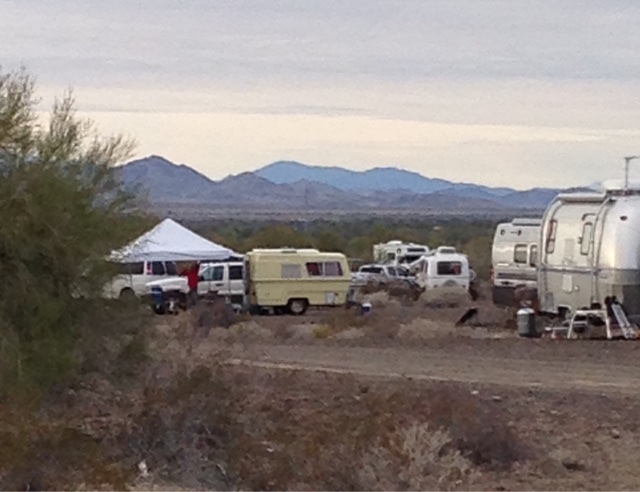 I arrived and there are about 100 campers in this area as part of the RTR group traveling in all kinds of vehicles; Trailers, truck campers, trucks with caps, tents, Class A, B & C, and so on. When I pulled in there were two Prius' near the center of the gathering spot. One I recognized was the white one that is Suanne's, who I knew from last year, and have mentioned in my previous blog posts. The other was was green one owned by a man who lives in/out of his Prius full time. There is also another Prius that is red and this man was living in his full time but now tows his behind his Class C.
The man who heads up this gathering is Bob Wells and he has asked the four of us to provide information at our daily seminar on this coming Wednesday. I will do a separate post on the Prius gathering. At 2:00 there is a seminar if he day to allow people to learn from others. 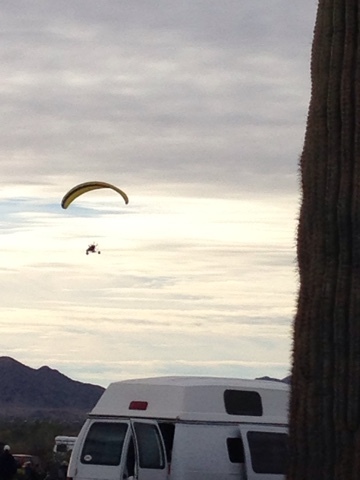 This guy with his motorized paraglide the flew over our camp. There was a group chili dinner but I didn't partake as I didn't plan on bringing anything so I made my own dinner. 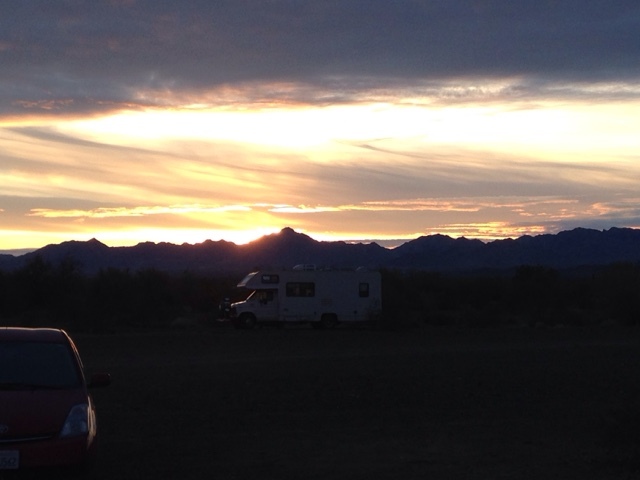 The sunset at the RTR. After dinner there is a campfire and then we were treated to a firedance show by a couple of woman in the group. Here she is blowing fire from her mouth. 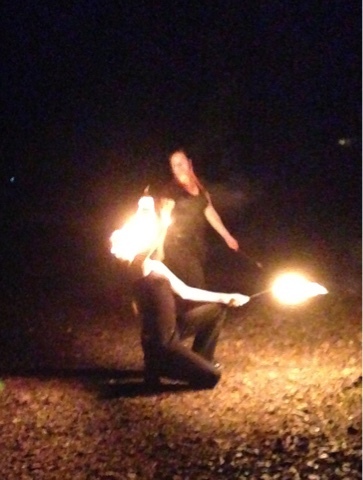 This picture looks one woman's head is on fire but it isn't. 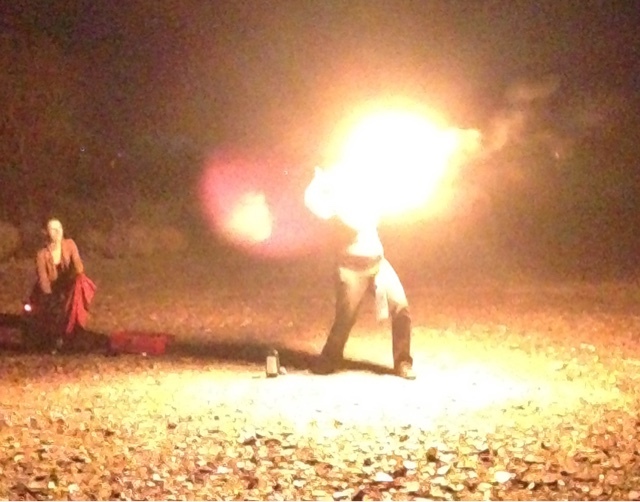 I think this picture about transferring fire. It was entertaining and as one guy said its like a mini Burningman. Not really but the artistry of the show did help with the image. I came with a neutral opinion of this gathering, not knowing if I would like it or not. After my first day I can say that all I met today were warm and friendly and are ther to ask questions and help each other if the need arises. Sitting in one area for any extended time is new to as I normally travel around a lot. Thanks for the enjoyable narrative and pictures. I almost feel like I'm traveling along. Thank you. My goal is to take many people along and share the experiences - since I'm not moving I will be blogging about the happenings.